﻿Are You at Risk of Developing Diabetes? The force of life exists inside us and around us. There is an ocean of energies, and even though we cannot perceive them with our five senses, they have a profound effect on us. One such energy is life energy, known as chi in China and as prana in Sanskrit.The world we are all familiar with, the physical world of matter, is not the only one in which we move and interact. Your physical body may walk in the world of matter, but a subtler aspect of you, woven within and throughout your physical body, moves and interacts on a level of pure energy. Science shows us that everything is made up of energy. It’s in the building block of all matter. The same energy that composes your body is also the one that makes up bricks of the house you live in. Your car, phone, animals, trees, you name it, are all composed of energy. It’is all the same and it’s all constantly ‘flowing’ and changing form. It’s impossible to isolate ourselves from the universe observer isolating ourselves because we are an integral part of it. From a spiritual viewpoint, we are deathless souls using a physical, energy-body to gain experiences here on Earth. The body is the vessel used by the soul, just as a car is driven by a driver. Since we and everything around us is energy, we must also be connected with everything. We are entangled. If we take this one step further, it would mean that the way you think and feel can change the world for the better. Thinking positive thoughts can influence those around you, causing a ripple in the energetic ether. It’s like a boomerang. What you send out comes back to you with a stronger force. If you are sending out positive vibrations, reflecting your true emotions and feelings, then the ‘boomerang’ will come back to you with positive events, people and circumstances, which we often view as ‘coincidences’. Is the inner world – the real world and can we dictate our outer world with what we think? Quantum Physics tells us that everything vibrates; everything is energy, and our thoughts are cosmic waves filled with potent energy. It seems we are all one energy and that we are all part of ‘a sea’ filled with energy. Our thoughts matter because we are part of a universal consciousness. By thinking and feeling, we are sending out cosmic waves which contribute to creating the universe as move through it. Scientists tell us that the universe is rapidly expanding, yet no-one can understand why. However, if we are part of the creation, by using our thoughts and feelings in our inner world, then it all starts to make sense. Religion and Science are fast approaching each other. From a scientific viewpoint, we see experimental evidence suggesting that we are all part of One Mind, One Energy, and a Universal Consciousness. From a religious perspective, we are told that we are particles of God. The more research that our quantum physicists do in this field, the more they realise that there is a power greater than us – a universal power, a power of pure energy and pure consciousness. The state of the world today is a result of collective human consciousness. The current state of the world is a direct representation of the average vibration that humanity is operating from. War, famine, fear, violence, hatred, frustration and conflict are all found in the world because they are within the internal state of humanity. But, at the same time, we are witnessing growth, love, kindness, expansion, forgiveness and change. This is, and it is happening on the planet today. 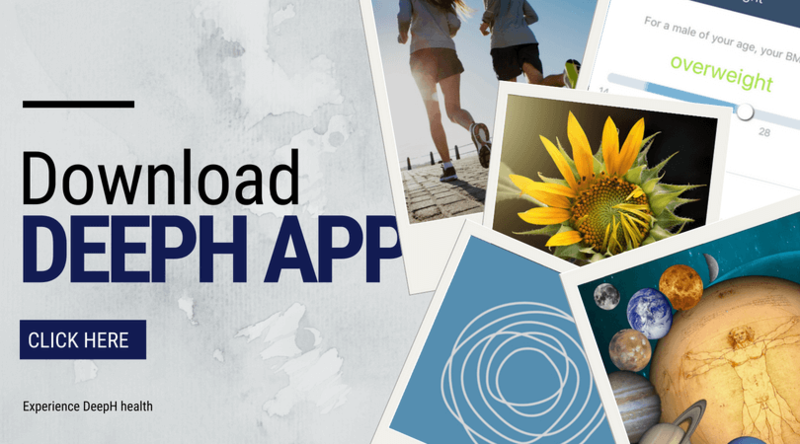 The DeepH app helps you to be more active, and live a healthier and happier life. With the DeepH app you can collect all your activity, fitness and health data in one profile and estimate your overall wellbeing status – DeepH score. 1. Connect the DeepH app with your Fitbit tracker.